There’s good memories of breakfast too. Dad suggesting and then making canned corn on toast on a Saturday morning. Nana guiding me from the white sugar to over to the more thrillingly caramelly brown sugar to pour over my porridge when I was staying with her. And now I love it – going out for brunch with Tim (well, we have to as cafe reviewers, so bully for us) or slouching round together in the kitchen in the early hours with a cup of tea or coffee pretending for a while we don’t actually have to leave the house and earn money. With this in mind, if you’ve got some time handy, nothing makes breakfast nicer than – of course – actually having something good to eat. 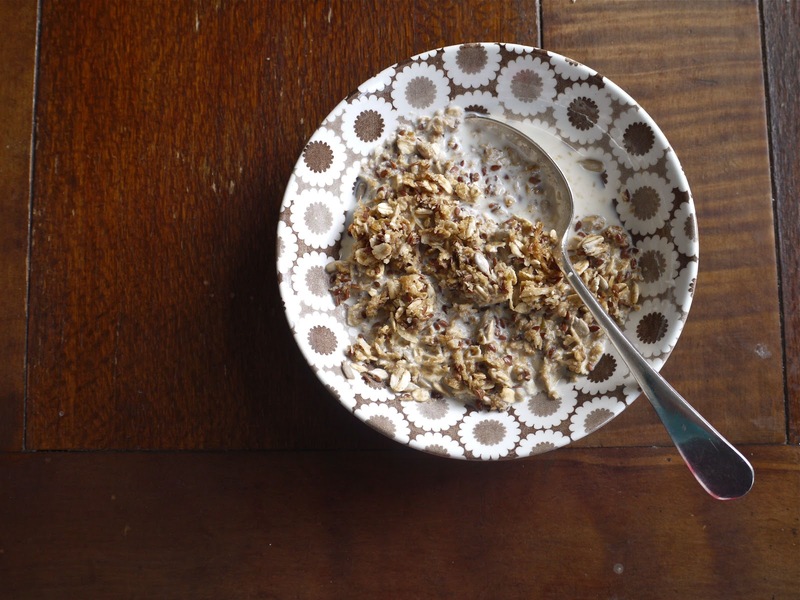 Granola is an elegant solution. Robust and filling, but importantly delicious – depending on what you put in it – and the recipe’s flexible. And best of all, once you’ve made it, you’ve got breakfast in five seconds, and all you have to wash up is a bowl and a spoon. No dishes at all if you just curl up with the jar and eat it by the handful till you’re ready to carry on with your day. 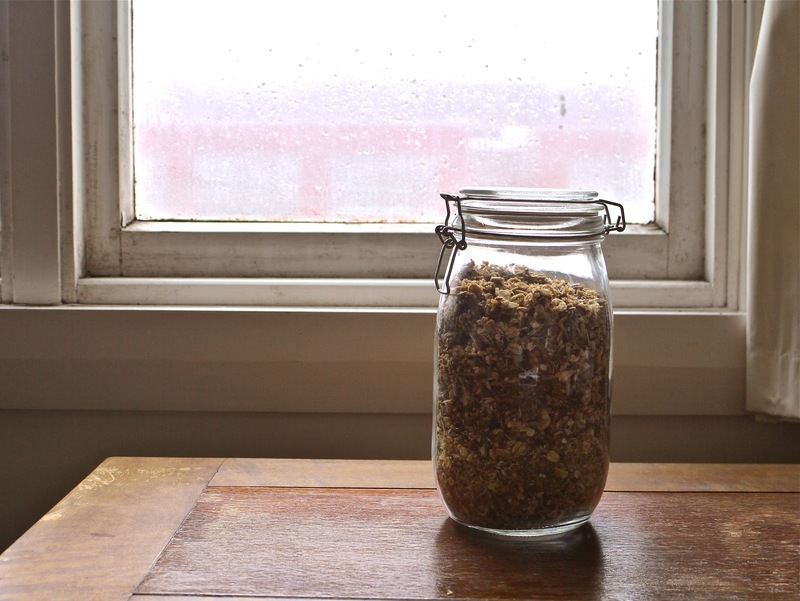 I’d been meaning to make granola literally forever. Okay, just a month or two, but whatever, sometimes I find it fun to use words that make people huffy about correct usage. I don’t mean harmful words that you say while also yelling “PC gone mad! PC gone mad!” as if it’s some kind of shield that lets you be an awful person…I just mean acting the fool. Also contributing to this might be the Parks and Recreation character Chris Traegar who reminded me how satisfyingly useless the word “literally” is. That said, this might not literally be granola. It’s more muesli with granola aspirations. But aren’t we all? Allegories aside, what I mean is: it’s a little more free-flowing and not quite as tooth-challengingly clumpy as proper granola, but on the other hand it’s nicer and cheaper than the stuff at the supermarket. If your cupboard is bare you’ll need to spend a bit of money to get the ingredients, but fortunately most of them are fairly cheap and this batch will last you for ages. This one has a one-two punch of grated apple and apple juice to impart crisp juicy flavour, cinnamon to make you feel warm and safe inside with every mouthful, and cashew butter for a bit of much-needed lusciousness. Ugh, I know, who has cashew butter? Well, I do – a Christmas present from my brother – and I wanted to use it in something specific. If you’re given to making your own granola maybe it’s not so difficult a pantry item after all, but if you don’t have it within reach, you could use tahini of course, or even peanut butter, which will affect the flavour a little but only in a “made on a production line that also processes peanuts” kind of way, I presume. Or just leave it out! This makes HEAPS. Initially I just had to leave it in the roasting dish until I’d eaten some, because we didn’t have a container big enough for it. Even now, several meals down, it’s divided between two big containers. Set your oven to 100 C. Line your biggest roasting dish with a big sheet of baking paper. Mix together all the ingredients from rolled oats to salt directly in the mixing bowl itself, then place in the oven, stopping to stir about every ten minutes or so, for thirty to forty minutes. Then, just when you think you’ve got away with not having to do any dishes, mix together the cashew butter, golden syrup, and apple juice till relatively smooth, and drizzle it over the roasting dish of oats. Don’t worry about covering it all – just mix it through. This is going to create some cluster action. Return to the oven for ten minutes, then turn the oven off and leave it in there to cool. If this isn’t an option – flatmate wants to roast a chicken or something – then just carrying on baking for another ten minutes after stirring it again. The apple flavour is surprisingly subtle after all that, but the harmonious pairing with cinnamon brings it out further than it would be on its own. This has crunch and warmth and sweetness and is generally a beautiful way to start the day. Or have it for dinner. And use what you can find – add sesame seeds or pumpkin seeds if you have them, use demerara or white sugar, leave out the quinoa and add wheatgerm, whatever. It won’t fail. It’ll give you sunshine on a cloudy day. 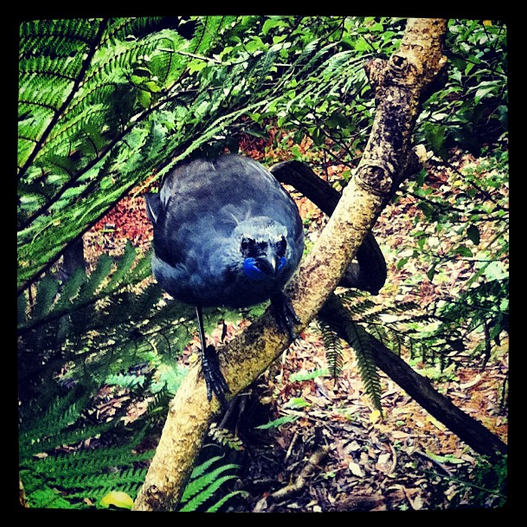 We had a charming weekend away in Greytown, which I won’t tell you much about since I’m going to be writing about it for the newspaper, but for now – just look at this kokako. All I knew about these glossy birds was gleaned from educational videos in school, where the main take-home message was: they are monumentally endangered. So to actually be able to see one at Pukaha Mt Bruce was pretty wonderful. We’re gazing at this rare, precious bird quietly and respectfully through the mesh fence that protected it from the outside world, taking in the moment. Then it starts flirting with Tim. Yes. Tim got openly hit on by an endangered native bird. It shadowed him as he walked the perimeter of the enclosure, continually jumping up to cling onto the mesh by Tim’s face and squawk at him plaintively. I was ignored entirely apart from this brief moment of eye contact between us in the photo above. Recognising a rival? Can’t blame the kokako, really. Oh yeah, and if you’ve got it, enjoy the Easter break! May I non-coyly recommend these Hot Cross Buns if you’re in the market for making them this year? Title via: Aretha Franklin’s Evil Gal Blues, a cautionary tale where she not only belts it out, but also accompanies herself on piano. Formidable. Under by Watercolours. Warming and chilling at the same time. Beautiful. Sherie Rene Scott, the Broadway star who is on my list of “people who have made me cry even though they’re only on a grainy YouTube video”. One of my favourites is of her singing I Miss The Mountains in a very early workshop of what would become the musical Next To Normal. Maybe quite specifically because of her vibrato on “mountains” at 1:54 and the way she says “meeeeeeh-iss” at 2:25. I’ve also been listening to a TON of podcasts (yeah, those things, I know, I only just got into Google Reader this year too) lately, if anyone has any they can recommend me then please go right ahead. Next time: I am right in the middle of making pulled pork for the first time, and if it tastes even one tenth as good as it smells, I’ll be one happy person. And therefore more likely to blog about it. i'm a peanut butter on toast girl but should really try to venture out of my rut … hows that kokako trying to cut your lunch ! Um, HELLS YEAH granola snap! And just general us-being-us-SNAP! Because not only are your twitter anxiety brain experiences mirroring mine, but my grandma made me creamed corn on toast for lunch during childhood school holidays AND she taught me that piling brown sugar on my weetbix and then pouring milk gently over was far, far more magical than normal caster sugar. Oh Laura, can't we please run away together? 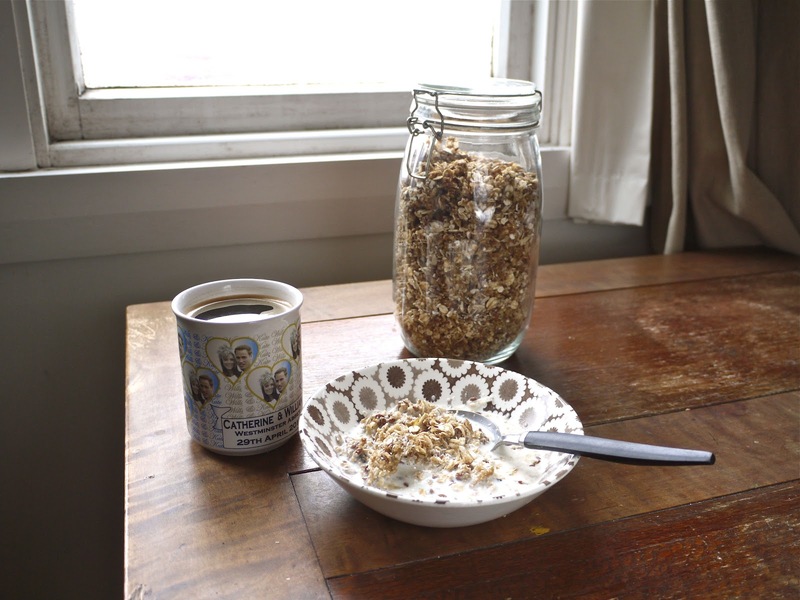 How about having ice cream on granola – or granola on ice-cream? I'm sure it covers most food group requirements! I haven't really gotten into the wild and wacky world of granola but I am a huge breakfast fan. This apple cinnamony deliciousness oculd definitely win me over to the dark side. 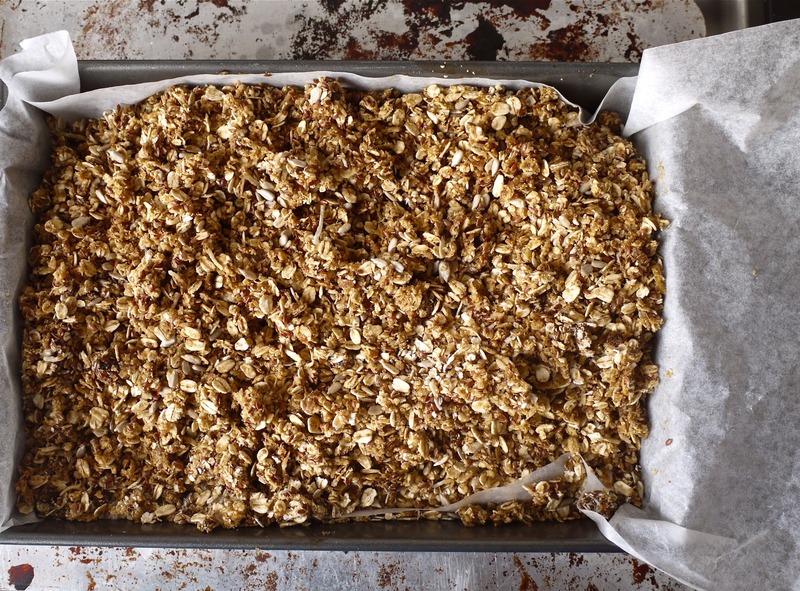 I tried a number of granola recipes before I managed to work out how to cook it right in my oven! Now I have though I love granola. I so keep meaning to make my own batch up but I'm lazy and end up buying oats and sprinkling on a seperate bag of very expensive fruit and nut topper. Must curb my ways! I really love the sound of your appley version! My cat has been getting hit on by birds, which is strange. Even birds aren't scared of my docile little lion 🙂 I guess that's not as fancy though as getting hit on by an endangered species – special man there Tim. Yummy! Looking good. Nice and nutritious! If you wrote a book definitely buy it. your work is great! I literally had those brown daisy plates when I was a kid. Filled with filthy weet bix, milk and sugar. Very occasionally though, Dad filled them with grated apple and milk. Much more suitable for such an elegant plate. I've made a lot of granola but have never though to add fresh apples before. Genius!